Solid third-quarter results were overshadowed by humble next-quarter guidance targets. Knee-jerk overreaction or justified market rage? You decide. 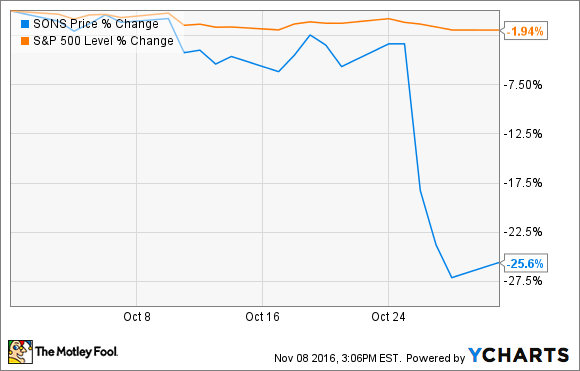 Shares of Sonus Networks (NASDAQ:RBBN) fell 25.6% in October 2016, according to data from S&P Global Market Intelligence. One glance at the chart below will clue you in on what happened: The cloud-based voice networking specialist paired a solid third-quarter report with downright depressing guidance for the next reporting period. In the third quarter, Sonus' sales declined 4.3% year over year to $65 million. Adjusted earnings per share increased from $0.11 to $0.12. These figures were at or above Wall Street's average estimates. But management's earnings guidance for the fourth quarter stopped at roughly $0.10 per share, far below the Street's then-prevailing $0.16 forecast. Analyst firms have since adjusted their expectations, and now predict that Sonus will underperform its own guidance targets, with fourth-quarter earnings near $0.06 per share. And when it comes to revenue guidance, management's former full-year targets had implied something like $76 million in fourth-quarter sales. Instead, Sonus now expects just $66 million in top-line collections for the next quarter. The timid revenue targets rested on several customers delaying their expected voice system upgrades while other installations are running behind schedule. Sure, sales can be lumpy for a small-cap company with just $261 million in trailing sales, but a sudden 13% guidance reduction takes lumpiness to the next level. Following that beat-and-lower performance, Sonus shares plunged 24.6% lower over the next three trading days. All told, the stock has taken a 17% haircut over the last 52 weeks. Mr. Market is not showing much confidence in this company's ability to execute on its promises these days.